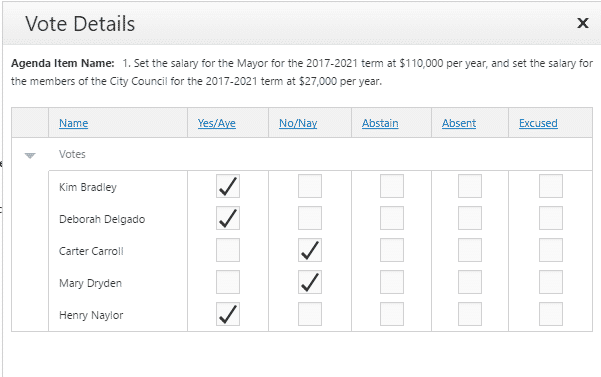 Council violated ordinances to pass pay raises for mayor and themselves. Will mayor veto? Will council rescind unlawful raises? A. Agenda Order - the confirmation of the agenda order is the first matter of business for council action. Any member of council may move to adjust the agenda. The Mayor or Council President may request the council to add an item to the agenda (emergency item) that is essential for the administration of the city government provided that the need for action on the matter arose after the 2:00 P.M. Thursday deadline, or that conditions beyond their control made it impossible to meet the deadline requirements. Emergency matters shall constitute those matters that threaten the well being and/or immediate safety of citizens of the community or employees of the city, would potentially disrupt the delivery of city services, would result in substantial increased cost in the purchase of necessary items for the administration of city government or would, if delayed, result in the loss of opportunity for significant economic development in the city. According to legal experts advising the Hattiesburg Patriot, a pay raise for the Council and the Mayor is clearly not an emergency. Adding this item as an emergency item was a gross violation of municipal code 2-22(A) and a blatant thumb of the nose to citizens who pay their salaries. Council practically said, "we can do what we want, how we want, and forget the legal process." But Council's violations didn't end there. 2-22(D)(1) Citizens Forum states that the citizen's forum shall take place after emergency items are added in 2-22(A) but before 22-2(E) Policy Agenda and 22-2(F) Routine Agenda. In the alphabet "D" clearly comes after "A" but before "E" and "F." Section 2-22 was created and ordered in such a way to give citizens an opportunity to comment on the agenda items, including the emergency items. However, Council moved the citizens forum to Monday from Tuesday without even voting on a move, There is no record of an official vote ever taking place to move 2-22(D)(1) to Monday's Agenda Review meeting from its intended place during Tuesday's meeting. Because Council failed to properly move Tuesday's citizens' forum to Monday, they are technically in violation of 2-22(D) as well. The effect of moving Citizen's forum to Monday from Tuesday clearly denies citizens their ability to comment on legitimate emergency items but also illegitimate "emergency items" like the recent pay raises. Agenda reviews are informal meetings, and council can add a comment period to that meeting for citizens, but they are still required to follow Chapter 2 Subsection 22 of the code of ordinances, until such a change in the ordinance is performed in a lawful manner. But, even so, citizens would still be denied opportunities to comment on newly added emergency items during Tuesday's meetings. NOTE - This information was obtained from Ward 4 candidate Joseph Rawson's letter to the mayor asking that he veto the approved item. Council could also rescind the item during today's meeting or at a special called meeting. Rawson's letter is embedded below. His letter was reviewed by attorneys advising this site prior to the publication of this article. 55% of perpetrators are managers. The following pertains to Mississippi: When a person steals property valued at more than $500, the crime becomes Grand Larceny. *Grand Larceny* is a felony under *Mississippi* law, punishable by imprisonment in the state penitentiary for a term of not more than 10 years, a fine of not more than $10,000, or both. *Embezzlement* valued at over $500: Those that embezzle funds or other property valued at over $500 will face felony charges that come with a fine of up to $25,000 as well as a sentence of up to 10 years in prison. And yet the constituents continue to elect the same crooked idiots. How stupid! They can’t have any raise if they are not reelected. SPEAKING OF JAIL TIME, HOW BOUT PRISON TIME! In closing….the law is what we say it is, boy! We are the law! We don’t give a damn about yo laws and ordinances! You, and the rest of the white rich people who are loaded with money just need to pay your taxes and be quite! And yes, we are going to raise them again next year and probably another pay raise to…….how you like that? Why do you think city, county and school taxes went up this year……you cant waste 7.5 million in your school system and millions on a still not built sewer system, all in one year, and get a raise without it. Why in the world would the mayor veto his money increase? The lovers of money would never veto !! That challenge was in the very last sentence of my speech tonight! Does their performance warrant a raise? I think not.